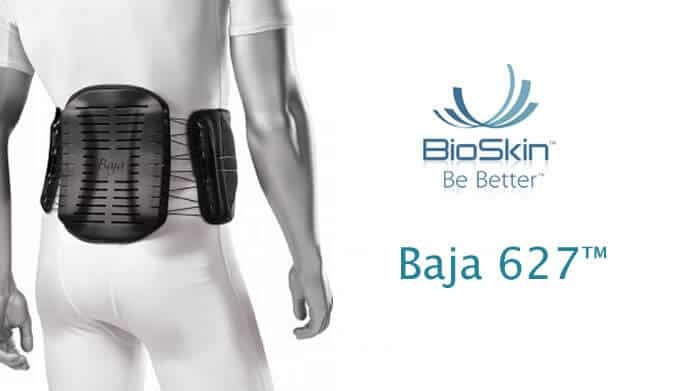 The Bio Skin Baja 627 provides unrivaled lumbar support and pain relief, allowing you to return to normal activity. It has a double lacing system with the two banks of pulleys positioned on the sides of the torso. When the patient engages the cinching mechanism, the posterior panel is drawn forward, focusing the compression on the soft tissues that support the spine. A recent study using the bilateral cinching mechanism of the Baja 627 showed an average reduction in VAS scores of 40% and a 41% improvement in Roland Morris Disability Questionnaire scores in patients with chronic low back pain. The Bio Skin Baja 627 back brace provides a highly effective lumbar support and pain relief to the user. It incorporates a bilateral pulley system that applies vectored compression to the lower spine. As the user engages the pulleys, they pull the brace’s lumbar panel towards the spine, thus applying targeted compression to the source of the pain. The brace includes two hot/cold gel pads as addtional sources of comfort and pain relief. A recent study using the bilateral cinching mechanism of the Baja 627 showed an average reduction in VAS scores of 40% and a 41% improvement in Roland Morris Disability Questionnaire scores in patients with chronic low back pain. Please see “Prospective Study of Lumbar Back Brace In an Interventional Pain Practice.” Rosenthal, Richard M.D. & Spencer, Shawn, BS. Practical Pain Management, (July/August 2011).